Cindy Sheehan lost her son Spc. Casey Austin Sheehan in an ambush in Sadr City, Baghdad, in early 2004. As information became available revealing that the war in Iraq was based on lies, she began speaking out against it and demanding the troops come home. In August 2005, she went to Texas, to ask President Bush to explain "the noble cause" for the war he cites in his speeches, and her efforts attracted thousands to create Camp Casey, and drew worldwide attention. This book is a clear, well-written statement of her case against the war and her plea for ending this senseless adventure. "I support Cindy Sheehan in everything she does, whether it’s running for Congress, or the president of the U.S. She’s a great American, not afraid to stand up for what she believes in." 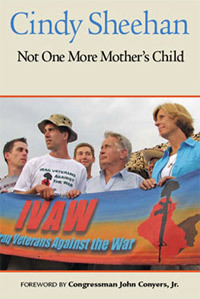 "More than any other single person, [Cindy Sheehan] changed the discourse about the war. She put a middle-American face on the antiwar movement at a time when it was widely caricatured as a ragtag collection of hippies, Stalinists, and movie stars. She forced the media—and the country—to acknowledge that antiwar feeling was widespread and growing and included even red staters, even military families. By her simple demand that Bush meet with her and explain why her son died, she pointed out the president’s evasions and befuddlement and arrogance—the ban on photographs of coffins, his seeming lack of concern for the deaths of soldiers, his basic refusal to engage. No matter that she sometimes seemed to be conducting her political education in public. She was a mother wrenched out of her ordinary life by tragedy—that is a very powerful and inspiring symbolic role."